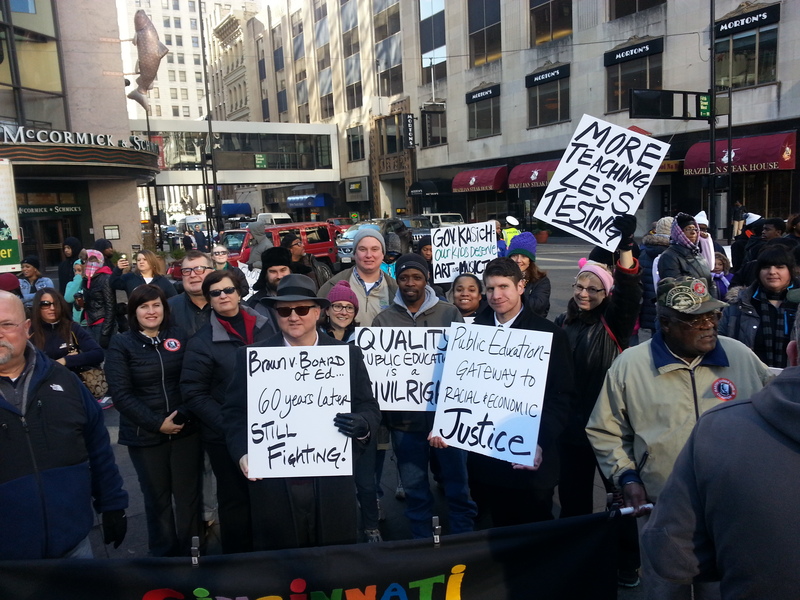 Cincinnati Educational Justice Coalition | Quality public education for every child! Quality public education for every child! Thanks to so many parents, teachers, community members – we STAYED busy last year! On so many fronts, the struggle continues. Join our continued work for education justice by joining our monthly meetings at 6pm every 2nd Thursday of each month at the offices of Community Shares of Greater Cincinnati, 315 W Court Street, Cincinnati, OH 45202. And, follow us on Facebook! The CEJC urged the Cincinnati School Board to reject the proposal by FC Cincinnati to enter into a “land swap” to demolish Stargel Stadium, build the school a new stadium on another site, and build an FC Soccer stadium so FC can qualify to be an MLS expansion team. We expressed this agreement was wholly inadequate to address the impact of an FCC stadium in the West End for the students, families, and neighbors who will be affected by the project. We urged the CPS Board of Education members to REJECT FC’s terms just on the CBA bullet point alone; authorizing a land swap before having a CBA approved by all parties, and requiring it be completed by June 30 demonstrates whomever drafted this has NO UNDERSTANDING of a Community Benefits process. We strongly urged the BOE to VOTE NO on this proposal. In the end, on March 17 the Board of Education voted to allow for the land swap. This was followed by Cincinnati City Council passing an Ordinance on April 16, 2018 that would give over millions of taxpayer dollars to FC to build their stadium. The CEJC joins the “NO FC in the WEST END” coalition to help get a Referendum Petition on the November, 2018 ballot. If you are interested in helping, please EMAIL US at cincinnatieducationjustice@gmail.com to help us circulate petitions. Saturday, March 17, 2018 the Coalition Against an FC Cincinnati Stadium in West End will hold a Rally and Community Grill-Out from 12pm to 2pm inside West End YMCA on Linn St. A press conference will be held at 1PM featuring West End Resident Speakers. We are demanding that FC Cincinnati publicly announce an end to its effort to force a stadium on West End Residents and further that the CPS Board of Education end the discussion and thus the toll this is directly and currently taking on the lives of West End Residents. Cincinnati’s history is that of repeated displacement of Black People and People with low incomes. This has been a constant effort by primarily white, wealthy people to possess, control and sell neighborhoods to other wealthy white people. Increasingly, individuals and companies are attempting to take the model of gentrification and displacement of people from Over-the-Rhine to more neighborhoods, including West End. We have not relented in telling every decision-making body to say no. The School Board has now demanded that FC Cincinnati pay their “fair share” of property taxes toward our children’s’ education, something FC Cincinnati has said they are not willing to do. “We were taught to NEVER let anyone make a decision for you, about you, without you. We will be here until the end of the WAR,” says West End Resident and Liberty St. Apartments Resident Association Vice President Contina Davis. We demand that FC Cincinnati cease its pursuit of West End and publicly state that they have will stop trying to force themselves on West End Residents. Further, we demand that the Cincinnati Public Schools Board of Education officially end conversation with FC Cincinnati. This is not simply a political struggle, this is having real affect on the lives of West End Residents right now. This is keeping people awake at night, fearful of what the future could hold for they, their neighbors and their children. It is past time to end this conversation. “The West End Community does not want the devastation the proposed stadium will bring to our front doors. Please not only listen but hear us say NO stadium in the residential heart of West End”, said Marsha Reese, President of Liberty St. Apartments Residents’ Association. The Coalition Against an FC Cincinnati Stadium in West End includes many West End Residents, Residents of Stanley Rowe Towers, Liberty Street Apartments, Park Town and City West, Community Church of Cincinnati, The Black Agenda, Jurisdiction-Wide Resident Advisory Board, the Cincinnati Chapter of the NAACP, the Cincinnati Educational Justice Coalition, Black Lives Matter Cincinnati, National Action Network Cincinnati Chapter, Cincinnati City Council Member Wendell Young, State Senator Cecil Thomas and the Greater Cincinnati Homeless Coalition. A Year in Review, The Work Ahead! The CEJC is proud of our accomplishments this year. See below for our “Year in Review, The Work Ahead”! October 6, National Walk-In for Public Education! The Cincinnati Educational Justice Coalition (CEJC) is joining with The Alliance to Reclaim Our Schools (AROS), linking together parents, educators, students, school staff and community members in dozens of cities across the country to WALK-IN to support the quality public schools that all our students deserve. Given the never ending attacks on public education that many of our cities endure, Walk-Ins provide a positive action that that says that these are our schools and our communities. JOIN US at schools across the CPS district as we stand with over 200 cities across the country. As public schools are increasingly threatened by a view of education that supports privatization, zero-tolerance discipline policies, less funding, and high-stakes standardized tests, the CEJC with AROS is fighting back with a broad vision of American public education that prioritizes racial justice, equity and well-resourced, world-class, public community schools. Walk Ins in Cincinnati will include a list of demands that include no more charter school proliferation, investment in the Community Learning Center model, adequate and equitable funding, and better engagement by the district to include parent, student, and community voice in decision-making. JOIN US! More details to follow, sign up for our newsletter for updates at this link: https://actionnetwork.org/forms/cejc-newsletter-sign-up. RSVP to this event on Facebook to share, and receive updates at this link: https://www.facebook.com/events/1659539234370001/. Subscribe to the CEJC Newsletter! Subscribe to the CEJC Newsletter and receive updates and get involved toward progress for education justice in Cincinnati! Welcome to the Cincinnati Educational Justice Coalition website! The Cincinnati Educational Justice Coalition (CEJC) is a coalition of parents, community, faith, labor and civic organizations, and engaged citizens. We are committed to ensuring every child has access to a public school system that provides an equitable and quality education in a positive learning environment. A core value of ours is our steadfast opposition to efforts to privatize our public schools through policies that promote competition rather than collaboration between schools. We believe that community voices should be at the center of educational policy, and are paramount to successful and sustainable solutions. We support the expansion and improvement of Community Learning Centers, because we know it is the best model for success. Welcome to our website. We are excited about sharing the work of educational justice with you!